Baton Rouge City/Parish Hall is located at 222 Saint Louis Street, Baton Rouge, LA 70802; phone: 225-389-5100. Photo: Magnolia Mound Plantation House, ca. 1786, 2161 Nicholson Drive, Baton Rouge, LA. Magnolia Mound is one of the few extant examples of a late eighteenth century settler's house and one of the earliest surviving structures in the Baton Rouge vicinity. Built ca. 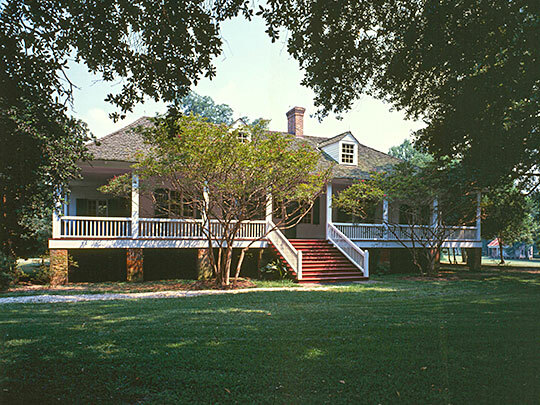 1786 on a ridge overlooking the Mississippi River, the original four-room plantation house is significant for its early cypress and bousillage construction. Circa 1815-1820, Magnolia Mound was enlarged and embellished in the Classical style. The plantation house possesses notable interior decoration including one of the first cove ceilings in the Mississippi Valley. Saved from the wrecker's ball in 1967, it has been restored as a historic house museum. Listed on the National Register of Historic Places in 1972. Photographed by David J. Kaminsky, 1978, Historic American Buildings Survey [HABS LA-1130], memory.loc.gov, accessed March, 2015. Baton Rouge is governed under a unique structure begun in 1949 and continuing today. A detailed history and explanation of this hybrid political entity can be found on the city-parish website: www.brgov.com. The area that is now Baton Rouge was discovered in 1699 by a French Explorer named Pierre LeMoyne Sieur d'Iberville. He gave it the name (literally, "red stick") memorializing a fish-blood tainted pole that was used as a boundary marker separating the territories of two Indian groups – the Houma and the Bayougoula. Through the 1700s it was variously controlled and ruled by French, English and Spanish interests. The city was incorporated in 1817, and became the state capitol in 1849, losing that designation during the Civil War, and subsequently restored as the capitol in 1882.